Not all the foods in the refrigerator get along like peas in a pod. The vegetables are steamed, and Bad Apple and Second Banana are the problem. Good Egg suggests his friends try different responses to these two bullies. They try hiding, then standing their ground. At first, Good Egg's tactics don't bear fruit. Only by using his noodle does Good Egg avoid getting scrambled and save his friends' bacon. 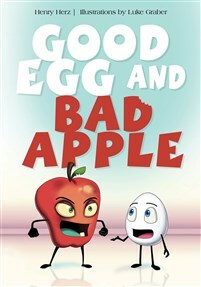 In this story told on two levels, young readers will be entertained by the hijinks of the anthropomorphic food characters and will appreciate the allegory about not letting one bad apple spoil the bunch. Adult readers are served plenty of food for thought with hilarious gastronomical idioms and puns. An author's note explaining all the wordplay adds English language educational opportunities.